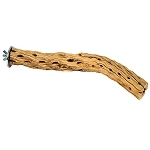 Home > Perches > Dragonwood Perch 12"
This manzanita alterrnative is great to add some different textures to your bird's feet. Made of solid dragonwood, this perch is sure to be a hit. 12" - diameters vary from 3/4" to 1-1/2". Please comment on diameter when checking out if important. 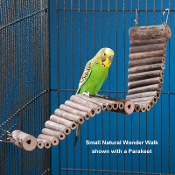 Deluxe Leather Bolt-on Perch - 10"
Polly's Shower Perch - 5/8" x 11"